With the increased availability of highly maneuverable unmanned vehicles, abundant ocean environmental data can be collected. Among the various ways of collecting the ocean temperature and current data, ocean acoustic tomography (OAT) is probably the most efficient method to obtain a comprehensive view of those properties in the interior ocean. OAT uses differential travel times (DTTs) to estimate the currents. Imagine two transceivers are separated by a distance R in a moving medium with sound speed of c. The sound transmitted from the transceiver upstream will travel faster than the sound from the transceiver downstream. By measuring the sound traveling in both directions, we can obtain the DTTs and from the DTTs we can determine the path-averaged current between the transceivers. What happens if the vehicles carrying the transceivers are moving? First, the DTTs are affected. The magnitude of the DTTs is reduced by the average speed of the vehicles . Second, the acoustic signals are Doppler distorted due to the relative motion between the moving vehicles. To determine the Doppler shift, we correlated the transmitted signals of different hypothetical Doppler shifts (replicas) with the received signals. The hypothetical Doppler shift yielding the maximum correlation is used to compensate the acoustic measurements and determine the acoustic arrival patterns. The Doppler shift measures the relative speed between two vehicles; however, relative speed isn’t sufficient to determine the ocean current speed – absolute speed (projected onto the path connecting the two vehicles) is required. If only one of the vehicles is moving, then the Doppler shift indicates the projected speed of the moving vehicle. If both of the vehicles are moving, we determine their average speeds by measuring the ground speed of at least one of the mobile vehicles. We determined the DTTs using the correlation-based method. The time series of the acoustic arrivals received at each pair of transceivers (reciprocal arrival patterns) are correlated to obtain the cross-correlated function (CCF). We selected the lag time corresponding to the maximum peak in the CCF as an average estimate of the DTT. We conducted a moving-vehicles experiment using two moving vehicles (auv and ship) and one moored station (buoy) in WangHiXiang Bay nearby Keelung City, Taiwan. 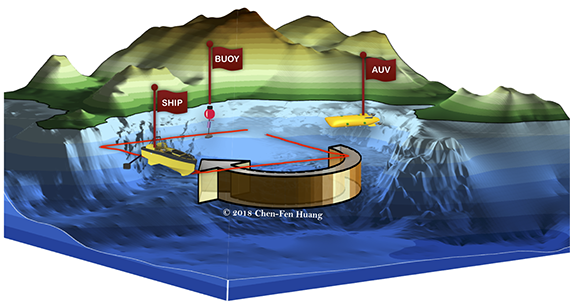 The AUV sailed near the shore while the ship surveyed in counterclockwise direction along a square trajectory. We installed the tomographic transceivers on the moving vehicles and the moored station. A DVL was on the ship for the validation of our current estimate. Taken together, the moving vehicles and the moored station construct a triangular formation which can be used to map the ocean currents. We used the distributed sensing method  to obtain the current field. The estimated current velocities near the ship show consistency with the point measurements from the DVL. We reconstructed the current distribution in the Bay using the acoustic data (the path-averaged currents) collected over the last 20 minutes. A small-scale eddy was revealed. Figure 1. Illustration of the acoustic mapping of ocean currents. Estimation of the current velocities near the ship for a) eastward direction and b) northward direction. The red circle and line indicate the DVL measurement while the black color indicates the DTT estimate. c) Spatial distribution of the estimated current field (yellow arrows) using the acoustic transmission paths indicated by the white lines. W. Munk, P. F. Worcester, and C. Wunsch, Ocean Acoustic Tomography, Cambridge University Press, 1995. C.-F. Huang, T. C. Yang, J.-Y. Liu, and J. Schindall, “Acoustic mapping of ocean currents using networked distributed sensors,” J. Acoust. Soc. Am., vol. 134, pp. 2090–2105, 2013.